The Effects component can be used in a variety of ways. The majority of the time effects are used to add additional asthetic appeal such as expanding a panel when a button is clicked, or having a panel fade out after some information has been submitted. Sometimes, however, they are used to emphasize important data. The simplest example of Effects is to hav a Highlight fire up once some information has been changed or submitted. In this example we will highlight the backing bean value for an inputText. 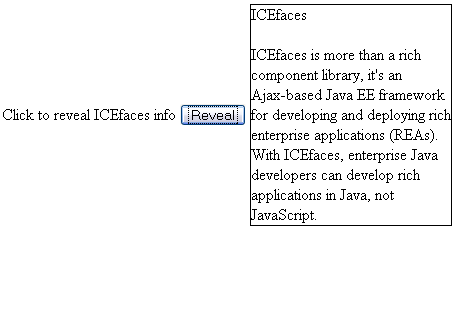 The text submitted in the inputText will appear in a panel, and will highlight. First you need to set up your jsp page. For this example we used just a few simple input and output text components. You also need to make sure that partialSubmit is set to true on the form component. Next you need to set the effect attribute to the backing bean on the text you want to highlight. In the backing bean you need to set up an Effect parameter and set the effect to fire when the text is retrieved. The following screenshot shows what the page looks like when the effect is fired. See the effects-basic demo for your self by clicking here, or download the effects-basic source code here. In this advanced example, we will show how to use an Effect component with a panelGroup. Here we will be adding a blindDown effect to a panel in order to reveal it. First, setup your panelGroup, then set the effect attribute of the panelGroup to the backingBean value, and set visible to false. Set the action attribute of your commandButton to the backing bean value. Then set up your backing bean as follows. The following screenshots show what the page looks like before clicking reveal and after. See the effects-custom demo for your self by clicking here, or download the effects-custom source code here. 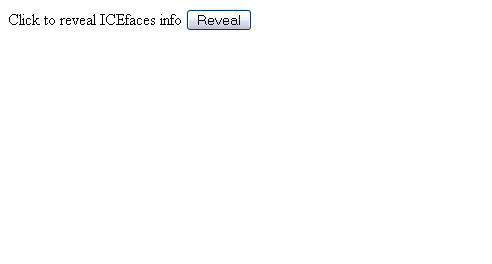 effects-basic effects-basic source code Simple example of how to setup effects component and backing bean. effects-custom effects-custom source code Demonstration of how effects component can be used with panels.